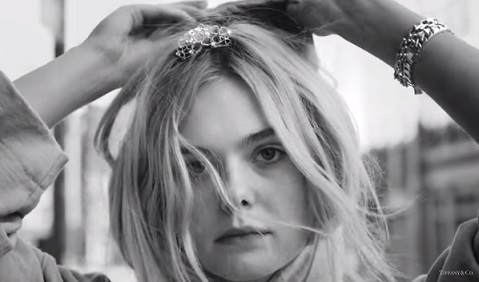 Elle Fanning is the face of the new Tiffany Paper Flowers collection, featured in Tiffany & Co.’s “Believe In Dreams” 2018 Spring Campaign. Shot by the “Hunger Games” director Francis Lawrence, the campaign film opens with a re-creation of the iconic scene from Breakfast at Tiffany’s in black and white, showcasing the famous 128.54-carat Tiffany Diamond, one of the world’s largest and finest fancy yellow diamonds, and goes on by featuring the young actress as a modern muse, who dances her way on the streets of New York, through a Tiffany Blue world, to a remixed version of “Moon River,” Tiffany’s first-ever recorded song with original lyrics by A$AP Ferg. When the hip-hop artist’s part begins, the ad turns into a world of color, with a cast styled in Tiffany Blue, including dancer Maddie Ziegler (famous for her appearances in Sia’s music videos), supporting Elle. The dance scenes have been choreographed by Grammy award winner Ryan Heffington. The Tiffany Paper Flowers collection, described as “a balance of refined femininity and industrial modernity,” includes a Diamond Open Flower Ring ($5,500), a Diamond Cluster Necklace ($75,000), a Pavé Diamond Flower Pendant ($8,000), Diamond Open Flower Earrings ($4,200) and more. The launch of the campaign for Reed Krakoff’s first jewelry designs for the brand was celebrated with a party at the Longchamp store on the Fifth Avenue where several celebrities, including Greta Gerwig, Zendaya, Sarah Paulson and Kendall Jenner, were present.